From the publisher’s description: From Chinese factories making cheap toys for export, to sweatshops in Bangladesh where name-brand garments are sewn—studies on the impact of globalization on workers have tended to focus on the worst jobs and the worst conditions. 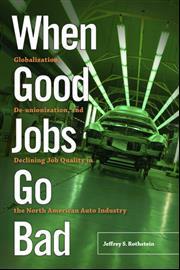 But in When Good Jobs Go Bad, Jeffrey Rothstein looks at the impact of globalization on a major industry—the North American auto industry—to reveal that globalization has had a deleterious effect on even the most valued of blue-collar jobs. Rothstein argues that the consolidation of the Mexican and U.S.-Canadian auto industries, the expanding number of foreign automakers in North America, and the spread of lean production have all undermined organized labor and harmed workers. Focusing on three General Motors plants assembling SUVs—an older plant in Janesville, Wisconsin; a newer and more viable plant in Arlington, Texas; and a “greenfield site” (a brand-new, state-of-the-art facility) in Silao, Mexico—When Good Jobs Go Bad shows how global competition has made nonstop, monotonous, standardized routines crucial for the survival of a plant, and it explains why workers and their local unions struggle to resist. For instance, in the United States, General Motors forced workers to accept intensified labor by threatening to close plants, which led local unions to adopt “keep the plant open” as their main goal. At its new factory in Silao, GM had hand-picked the union—one opposed to strikes and committed to labor-management cooperation—before it hired the first worker. Rothstein’s engaging comparative analysis, which incorporates the viewpoints of workers, union officials, and management, sheds new light on labor’s loss of bargaining power in recent decades, and highlights the negative impact of globalization on all jobs, both good and bad, from the sweatshop to the assembly line. JEFFREY S. ROTHSTEIN is an associate professor of sociology at Grand Valley State University, in Allendale, Michigan.